For the stadium in Turin, see Stadio Olimpico Grande Torino. For the San Marino national stadium, see Stadio Olimpico (San Marino). For the stadium in Porto Alegre, see Estádio Olímpico Monumental. The Stadio Olimpico is the main and largest sports facility of Rome, Italy. It is located within the Foro Italico sports complex, north of the city. The structure is an asset of the Italian National Olympic Committee and it is used primarily for association football. The Stadio Olimpico is the home stadium of Lazio and Roma and also hosts the Coppa Italia final. It was rebuilt for the 1990 FIFA World Cup and it hosted the tournament final. Rated an UEFA category four stadium, it has also hosted four European Cup finals, the most recent being the 2009 UEFA Champions League Final. Outside football, the stadium is used by the Italian national rugby union team and it is Italy's national athletics stadium. Occasionally, it hosts concerts and events. Throughout its history, the Stadio Olimpico has undergone several renovations. In its first stages, the Stadio Olimpico was called the Stadio dei Cipressi. It was designed and constructed within the larger project of the Foro Mussolini (Mussolini Forum) which was renamed Foro Italico after the war. Construction work began in 1927 directed by the Turinese engineer Angelo Frisa and architect Enrico Del Debbio. The construction was completed in 1932, after a few variations to the original plan. For instance, the construction of masonry stands was not part of the initial plan as, originally, stands consisted of grassed terraces. In 1937, the construction of a second tier of stairs was started but was interrupted in 1940 due to the outbreak of World War II. In December 1950, the working site was reopened for the completion of the stadium. The project was entrusted to the engineer Carlo Roccatelli, a member of the Superior Council of Public Works. At first, the plan was for a stadium with a more complex structure than that actually realised. However, the scarcity of funds and the environmental characteristics of the area led to a less ambitious building. On the death of Roccatelli in 1951, the direction of the work was entrusted to architect Annibale Vitellozzi. The stadium now reached a capacity of about 100,000 people, hence the stadium was known as Stadio dei Centomila, until renamed for the 1960 Olympics. The building was inaugurated on 17 May 1953 with a football game between Italy and Hungary. During the 1960 Summer Olympics, the stadium hosted the opening and closing ceremonies and the athletics competitions. Seating at ground level was eliminated with the result of an actual capacity of 65,000 spectators. Subsequently, the stadium hosted several editions of the Italian Championships of Athletics, the 1975 Summer Universiade (the stadium was the only venue for the Universiade) and the 1987 World Athletics Championships. It still hosts the annual meeting of the Golden Gala. For the 1990 FIFA World Cup, for which it was the main stadium, the facility underwent an extensive renovation. While that work was underway in 1989 the Capitoline teams Lazio and Roma had to play their Serie A games at Stadio Flaminio. The work was entrusted to a team of designers including the original architect Annibale Vitellozzi. From 1987 to 1990, the construction plan was amended several times, with a consequent rise in costs. Ultimately, the Olimpico was entirely demolished and rebuilt in reinforced concrete, with the exception of the Tribuna Tevere which was expanded with the addition of further steps and of the curves which were closer to the field by nine metres. All sectors of the stadium were provided with full coverage in tensostructure white. Backless seats in blue plastic were installed and two giant screens built in 1987 for the World Athletics Championships were also mounted inside the curve. In the end the new version of the Olimpico had 82,911 seats. It was the 14th stadium in the world for number of seats among the football stadiums, the 29th among all stadiums and the second in Italy, just behind the San Siro Stadium of Milan. The Stadio Olimpico was host to five matches in which the Italian national team took part and the final between West Germany and Argentina. West Germany won the final match 1–0. With the same layout from 1990, the Stadio Olimpico hosted on 22 May 1996 the UEFA Champions League Final between Juventus and Ajax which saw the Bianconeri prevail in a penalty shoot-out. An internal panoramic view of the Stadio Olimpico in May 2017. In 2007, a vast plan of restyling the internal design of the stadium was laid out, to conform to UEFA standards for the 2009 UEFA Champions League Final which was held in Rome. The work was performed and completed in 2008. It included the establishment of standard structures with improvements in security, the fixing of dressing rooms and of the press room. It also included the replacement of all seats, the installation of high definition LED screens, the partial removal of plexiglas fences between spectators and the field and a reduction of seating to the current capacity of 70,634. In order to enhance the comfort of the audience, part of the modernisation of the stadium involved increasing the number of restrooms and fixing the toilets. As a result of these improvements, the Stadio Olimpico was classified a UEFA Elite stadium. 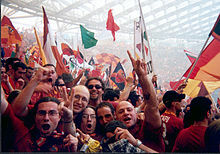 Curva Sud, used as the home end by Roma supporters. Curva Nord, used as the home end by Lazio supporters. For end stage concerts/shows it can hold up to 75,000. For center stage concerts/shows it can hold up to 78,000. The 1968 European Championship final match saw Italy win against Yugoslavia 2–0. The 1977 European Cup Final match saw Liverpool win the trophy against Borussia Mönchengladbach 3–1. The 1980 European Championship final match saw Germany win against Belgium 2–1. The 1984 European Cup Final match saw Liverpool win the trophy after a penalty shootout against native team Roma (regular time ended 1–1). The 1990 FIFA World Cup Final match saw West Germany win against Argentina 1–0. The 1996 UEFA Champions League Final saw Juventus win the trophy after a penalty shootout against Ajax (regular time ended 1–1). The 2009 UEFA Champions League Final saw Barcelona win against Manchester United 2–0. The 2013 Six Nations Championship saw the Italian rugby team beat France for only the second time in the championship and the first time at this stadium. The 2013 Six Nations Championship saw the Italian rugby team beat Ireland for the first time ever in the championship. # In 1989–90 season both teams played at Stadio Flaminio during the renovations of Stadio Olimpico. The stadium was one of the venues of the 1990 FIFA World Cup, and held six matches. The first five involved host nations Italy. All their Group A matches (1–0 wins over Austria 9 June and United States on 14 June respectively and a 2–0 win over Czechoslovakia on 19 June), their Round of 16 match against Uruguay on 26 June winning 2–0 and their Quarter-finals against Republic of Ireland on 30 June winning 1–0. The sixth was the Final where West Germany and Argentina on 8 July with West Germany winning 1–0. 17 July 2006 Depeche Mode Scarling. Franz Ferdinand Touring the Angel The concert was recorded for the group's live albums project Recording the Angel. 16 June 2009 Depeche Mode M83 Tour of the Universe The concert was recorded for the group's live albums project Recording the Universe. 8 October 2010 U2 Interpol U2 360° Tour The performance of Bad was recorded for the group's live album U22: A 22 Track Live Collection from U2360°. We Are the Ocean The 2nd Law World Tour The concert was filmed and recorded for the group's concert film and live album Live at Rome Olympic Stadium. ^ "Stadi Serie A 2015-2016" (PDF). Archived from the original (PDF) on 1 September 2015. ^ 1960 Summer Olympics official report. Volume 1. pp. 56-7. ^ "Stadio Olimpico – nuove tecniche di safety & security". Vigili del Fuoco. Retrieved 15 July 2009. Wikimedia Commons has media related to Stadio Olimpico (Rome).